PALM SPRINGS, Calif. - Nov. 15, 2018 - PRLog -- The American Law Institute Continuing Legal Education (ALI CLE) is pleased to announce the addition of keynote speaker and President Emeritus of The College of William & Mary, W. Taylor Reveley, III, to the agenda of Eminent Domain and Land Valuation Litigation. President Reveley's talk on "Property Rights: Foundation for a Free Society" will kick off this nationally acclaimed conference on January 24-26, 2019, in Palm Springs, California. 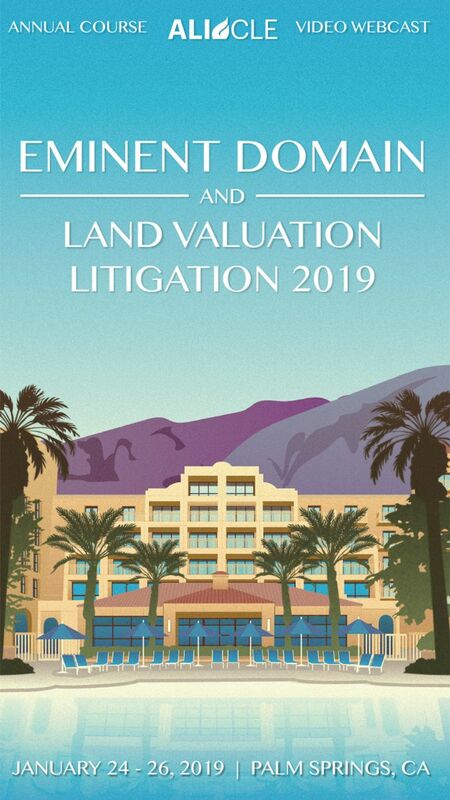 Law professors, government officials, members of the judiciary, and private practitioners make up Eminent Domain and Land Valuation Litigation's respected faculty. This conference offers dual tracks, as well as more introductory-level presentations, so that attendees can create customizable experiences through the unique curriculum. "Not only does this conference bring together the national experts on the cutting edge of eminent domain and related topics under one roof," said planning co-chair, Robert H. Thomas, "we pride ourselves on our welcoming environment, with multiple networking opportunities for you to get to know your colleagues one-on-one." To learn more about this program and to register for the in-person course or webcast, click here. ALI CLE is the continuing legal education division of the American Law Institute. ALI CLE, a non-profit organization, is committed to the work of promoting continuing professional education for lawyers throughout the United States and to creating standards to ensure quality and relevance in CLE programs. ALI CLE is constantly evolving to meet the needs of the legal profession, furthering a tradition of unparalleled service to lawyers. Follow the latest announcements and news at https://morethancle.ali-cle.org/ and on Twitter @ALI_CLE.